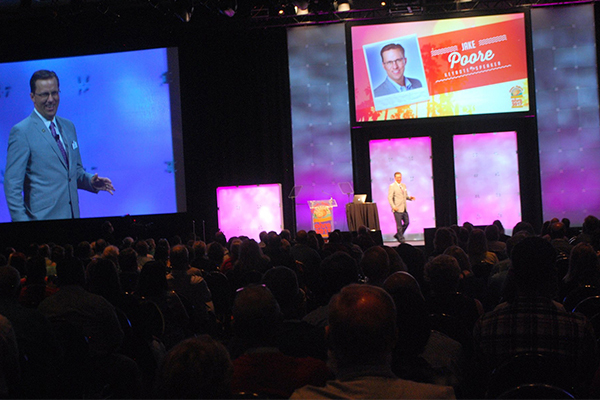 Jake Poore is a master storyteller who infuses expertise and humor to connect with audiences. 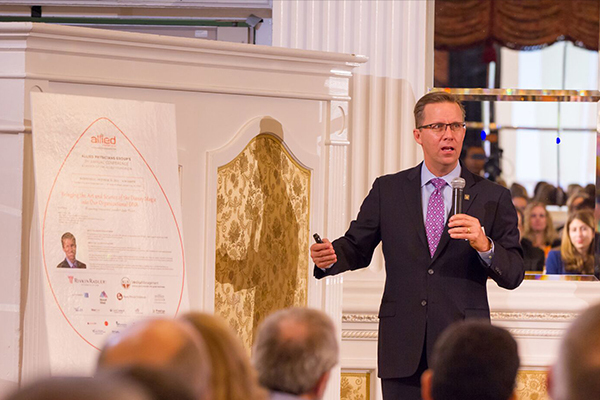 An in-demand international speaker, Jake has delivered 1000s of presentations to groups large and small — from the c-suite to front-line employees, small group workshops to annual meetings. 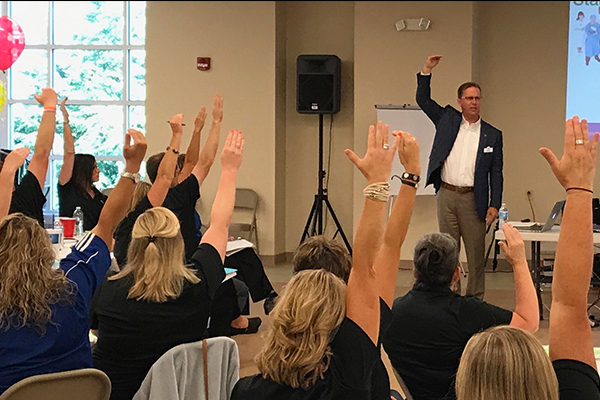 Jake consistently receives top ratings from audiences and he always leaves them with tangible ideas they can use right away to improve the patient and employee experience. Below is a sampling of the speech topics we offer. Can’t find what you’re looking for? Give us a call at (407) 859-2826 or drop us a line here (Info@WeCreateLoyalty.com) to explore more options to customize a presentation for your next event. Whether you have a title or not, everyone is a leader. We all have a circle of influence on others. 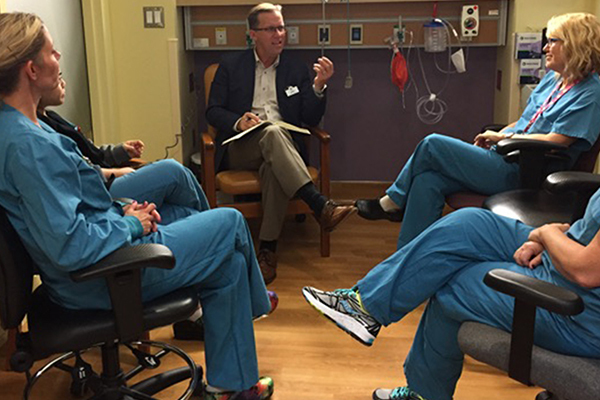 Great leaders not only take care of our patients and customers, they inspire their colleagues and associates. In this session, participants will understand both the approach and the tools successful leaders use to elevate experiences to world-class status. Patients today say they want to be treated as individuals and not just identified by their acuity or clinical ID number. They tell us that exceptional experiences occur when we consistently meet their expectations on what we provide (the clinical care side) while exceeding their expectations on how we provide it (the service side). Go with Jake as he takes you on a journey, looking at some of the best practices and lessons learned from organizations known for their world-class service, delivered consistently and seamlessly through the eyes of their customers. In this engaging presentation, Jake will share his insights and experiences on the secrets to success and how you can build it within your own service area. Everyone today wants to know how to get their patient satisfaction scores to go up and stay up. But, improving the Patient Experience can no longer be merely an initiative, side project or the stuff of an ad hoc task force. Delivering excellent patient experiences consistently must be part of your organization’s DNA – a reflection of who you are as a healthcare provider. In this dynamic presentation, Jake will share a simple tool to help you weave loyalty into your operational protocols. He’ll share the two levels of every patient interaction and how, when those levels are balanced, trust is established and reinforced between patients and caregivers. This simple-but-elegant concept not only applies to individual patient interactions; it will also impact your team huddles and meetings, how you conduct employee one-on-ones, how you write your daily emails — in short, it will show the value of treating employees exactly the way you want them to treat patients. Is it Only About the Clinical Expertise or the Newest Machines? Or Do Patients Want More? We’re living in an Experience Economy where patients are consumers, and consumers have more choices than ever before. Overall, clinical excellence is consistent among care facilities; but the real opportunity, or key differentiator, is in your organization’s ability to consistently exceed expectations on the service side of care. How do you move from merely satisfying patients to loyalty and ultimately, advocacy? How do you earn higher patient satisfaction scores, inspire a highly engaged workforce, and produce a more robust bottom line? The key to driving each of these outcomes is to deliver a Patient Experience that not only meets clinical objectives but also exceeds service expectations. Why? Because the Patient Experience is affected by everything that happens on the clinical side as well as the non-clinical or service side of care. Healthcare Marketing: Who Holds the Purse Strings? Women drive approximately nearly 80% of all consumer purchasing (source: Forbes) and roughly 94% of all healthcare decisions (source: Fierce Healthcare), through a combination of their buying power and influence. As the so-called Chief Medical Officers of their families, women hold the purse strings when it comes to medical decisions and choice of care. They expect good clinical outcomes, but they demand excellent service for themselves and their families — and they won’t hesitate to switch providers and drive further, pay a higher deductible, and shop around until they find what they want. Patients Want Transparency in Healthcare Costs: How Much is This Going to Cost? Consumers don’t buy a car, house, or other high-ticket item without knowing the cost upfront, and they expect the same level of cost transparency in healthcare. Studies show nearly 90% of patients want to know their medical costs in advance of receiving care. By providing the service of greater transparency in costs up front, in a hassle-free, easy to understand manner, we can reduce the stress and anxiety patients feel when it comes to the healthcare choices they face for themselves and for their family. These days, healthcare isn’t just a visit for your sick body. It’s a lasting experience for your mind. People return to their favorite restaurants – why? They had service that makes them feel individual, important. Patients these days are expecting more from their healthcare providers as if they are the waiter/waitress at their favorite restaurant. As those expectations are rising, our service should also be rising to exceed those expectations. The healthcare world is becoming increasingly competitive, so the key question to ask is: How do we keep our patients our patients? In this dynamic presentation, Jake Poore will share with you the root of patient loyalty, and the best practices that lead to it. Providing exceptional clinical experiences is not enough for today’s increasingly demanding healthcare client: you have provided both clinical expertise with compassion, and you have to do both consistently. Healthcare organizations that are able to always deliver on both the clinical and “human” parts of patient interactions are seeing success and are differentiating themselves in the industry. Join Jake Poore as he shares the challenges and successes healthcare organizations experience in striving to reach a high degree of excellence and consistency in patient interactions. He will share the two levels of every client interaction and how, when those levels are always handled well, trust is established and reinforced between clients and caregivers. Organizations known for providing world-class service are also known for their ability to tell stories and motivate others through storytelling. Most employees will not remember data, models, concepts and graphs, but when told through an engaging story, not only do they understand the concept or message, but they can retell the story to others, thus sharing the message and reinforcing your organization’s unique culture. Amid all the chatter about big data, analytics, and evidence-based medicine, there is one fundamental truth: healthcare organizations and their team members are transformed by their stories. Go with Jake as he takes you on a storytelling journey sharing best practices and lessons learned from organizations known for their exceptional experiences, delivered seamlessly and consistently, and guiding your leaders to develop their own stories to share. The future of healthcare lies in improving and elevating the Patient Experience to world-class status … and your physicians can be your secret ingredient! Physicians are facing increasing productivity pressures as they balance paperwork and time constraints. 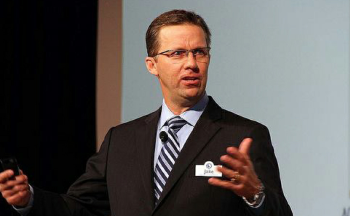 Join Jake Poore as he shares specific strategies for actively engaging your physicians in creating, design and ultimately model a culture of both clinical and service excellence across the continuum of care. As a worker in healthcare today, many can feel bogged down by daily job tasks and ever-changing initiatives, forgetting why they chose healthcare a profession, to begin with, and can sometimes feel like work has become a chore instead of a privilege to making difference in the lives of others. 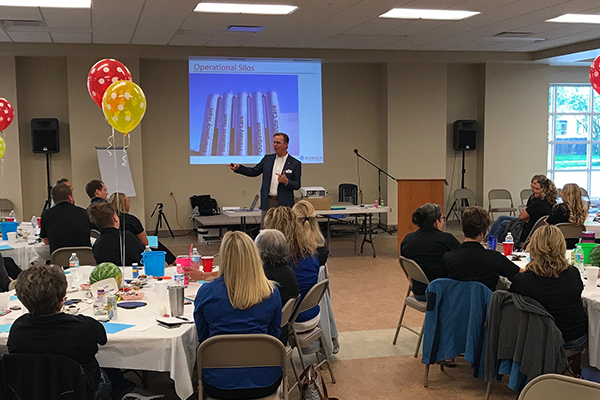 Jake understands this and will share simple tools and a comprehensive approach to help you re-engage you and connect your fellow co-workers to their intentional role on the care team. The Secret Formula For Creating Patient Experience Magic! In order for us to personalize this highly popular speech, we’ll need to be in touch with you to learn more your organizational needs and goals. This is a necessary first step so we can customize this speech (which shares lessons learned and the very best practices of Disney’s world-class service culture) to ensure a perfect fit for you and your organization. Note: Jake has a forthcoming book, “99 Lessons Learned from Disney to Improve the Patient Experience,” which will be published soon. Contact us to learn more. 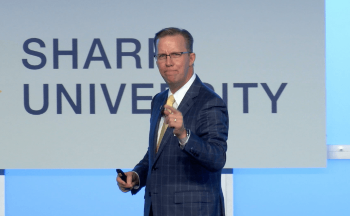 In this dynamic presentation, Jake shares the keys to creating and sustaining exceptional employee and patient experiences, and pitfalls to avoid. Good care is no longer good enough for patients today. We now live in an Experience Economy where clinical and operational excellence is assumed, but service excellence is expected and demanded. Patients want to be cared for but they also demand to be handled with care. And, they want it delivered consistently … in a culture of always. They want you to treat their illness while also treating them as unique individuals. In this dynamic presentation, you will see the successful case study of how it was accomplished at Dignity Health clinics and hospitals, through a proven LEAN-like approach to dissecting both the art and science of culture to create blueprints for hardwiring sustainable world-class patient experiences. In this presentation, Jake shares how healthcare organizations can successfully “hardwire” great patient experiences by starting with clear messages in the board room, “localizing” those messages down through the organization and ensuring accountability all the way back up to the boardroom once again. Additionally, he will share the keys to creating and sustaining exceptional employee and patient experiences, and pitfalls to avoid. There are storytellers who come in, and you think, oh, that’s a sad story, but they leave and you say, so what? Jake Poore has the ability to tell a story and get every person who hears it to realize the “so what”- how I apply that in my role no matter who I am. 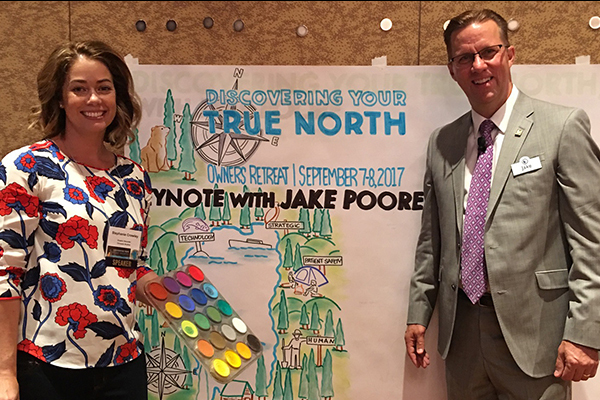 I had the opportunity to hear Jake speak at the ACHE conference a couple of weeks ago and I was very impressed by his approach. Without any exaggeration, I would say that he was the best speaker I heard in the three days that I was there. He was engaging and clearly an expert in the area of building customer loyalty as well as making the connection to improving the patients’ experience. 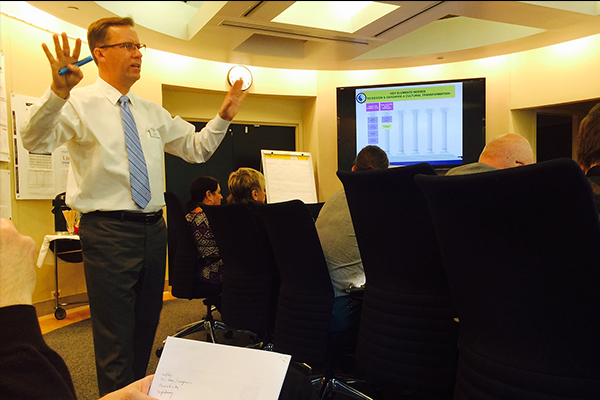 Jake’s presentation and focus get to the heart of the matter in any hospital or health system. And that is creating a sustainable culture that is always, not sometimes, but always patient focused. 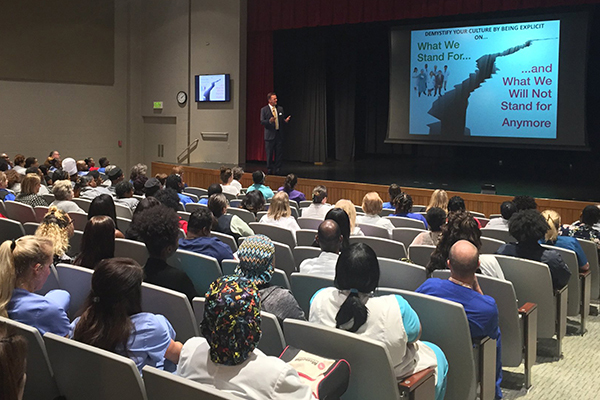 Jake’s presentation which is engaging, insightful and never boring, as well as the methods he uses for creating the patient focused sustainable culture is a must see experience.